At the Embedded World conference held in Nuremberg, Germany this week Silicon Labs unveiled its Blue Gecko platform aimed squarely at Internet of Things applications. Silicon Labs have combined both their EFM32 Gecko MCU technology together with a 2.4GHz Bluetooth Low Energy transceiver (including a power amp and balun giving at least +10 dBm output power) on one die. The 32-bit MCU inside the wireless SoC runs Bluetooth protocol stacks and scripting language developed by Bluegiga. Blue Gecko SoCs are based on ARM Cortex-M3 and M4 cores with 128 to 256 Kbyte flash and 16 to 32 Kbyte RAM. 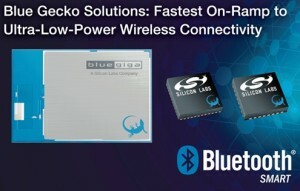 Silicon Labs are offering the complete Bluegiga Bluetooth Smart software stack for Blue Gecko modules and wireless SoCs. 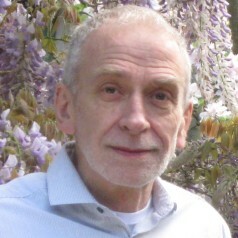 The stack implements the Bluetooth Smart protocol layers including the Attribute Protocol (ATT), Generic Attribute Profile (GATT), Generic Access Protocol (GAP) and security manager together with connection management. According to a company representative the Blue Gecko wireless SoC family represents the first of many families of IoT products that Silicon Labs are planning to introduce. The Blue Gecko development environment includes a wireless SDK for Bluetooth Smart applications using either a host or fully standalone applications via a BGScript scripting language developed by the Finnish company Bluegiga which Silicon Labs acquired earlier this month. The Bluegiga SDK and Bluetooth Smart software stack will be available to developers at no charge.